Let's talk for a minute about the new book United Cakes of America: Recipes Celebrating Every State by Warren Brown, owner of the CakeLove empire in the DC area. I love the idea of this book: a sweet show of patriotism, dedicated to celebrating the cakes unique to each region of the USA, including recipes and stories. And for the most part, I love the result: it's beautifully designed, well written, and so far, the recipes are tasting most excellent. My only reservation about the book isn't so much a complaint about the content as a wish that even more had been done to delve into the history--including the hows and whys--of each region's cake. Several of the entries--Hartford Election Day Cake, Hummingbird Cake, and Red Velvet Cake, for instance--come with insightful histories and thoughts on why the cakes might have come into their own in a certain region, and I found these to be the most fascinating parts of the book. However, other entries are more loosely tied to a region, simply inspired by other flavors popular in the area rather than truly zeroing in on the region's cake specialty. For instance, the Washington entries are for Apple Cake and Coffee Buttercream, respectively. While both apples and coffee definitely have a strong presence in Washington, and I have no doubt that the recipes are delicious, I wouldn't consider these cakes that really represent the area. But you know what? If the only reservation about this book is that I wanted more, that's really not such a bad thing. Here's one of my favorite entries so far, the Connecticut cake: an updated version of Hartford Election Day Cake, which was probably an American adaptation of English fruitcakes, which has since evolved into the below delicious spice cake. Spicy and flavorful, these cupcakes are quite light, but don't worry--a healthy dollop of the old-fashioned milk buttercream (which, by the way, smells and tastes so good that you might just want to lick the bowl) anchors them down quite deliciously. 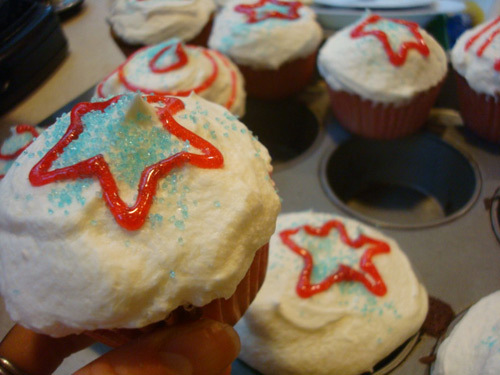 And it's a perfect recipe to dress up in red, white, and blue for the 4th of July! Preheat the oven to 325°F and place the rack in the middle position. Lightly coat a cupcake tray with nonstick oil-and-starch spray and line 10 of the cups with paper liners. Measure and combine all the dry ingredients in a deep bowl. Whisk lightly for about 15 seconds to blend. Combine all the wet ingredients in a container with a tight-fitting lid and shake well for 15 seconds. Lightly whisk the wet ingredients into the dry ingredients. This should take about 15 seconds. Bake for 20 to 25 minutes, or until the tops of the cupcakes are golden brown and a wooden skewer inserted in the center of one comes out clean or with just a few crumbs. Cool the cupcakes for five minutes before removing them from the tray. When they are room temperature, frost or decorate them with Old-Fashioned Milk Buttercream (recipe below). Optional garnish: sprinkles, decorating gel, etc. Quickly whisk together 4 tablespoons of the milk with the flour. This slurry will be somewhat thick, so whisk thoroughly to make it smooth. Press out any lumps with a flexible spatula, if necessary. Whisk in the rest of the milk and transfer the mixture to a 2-quart heavy-bottom saucepan. Bring to a simmer for about 30 seconds over medium heat, whisking the whole time. Remove the pan from the stove and place plastic wrap directly against the milk’s surface. (This is the best method to prevent a skin from forming.) Cool to room temperature. Combine the butter, sugar, salt, and vanilla in the bowl of a standing mixer fitted with the paddle attachment and mix at medium to high speed for 5 minutes. Pour the cooled milk-and-flour mixture into the bowl and beat for another 5 minutes, or longer, as needed to achieve a spreadable consistency.